Valery Giscard d'Estaing has been elected President of France, winning the second round of elections by a narrow margin to defeat Francois Mitterrand, the communist-backed socialist. 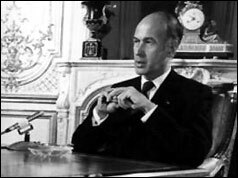 Mr Giscard, the Gaulliste-backed Independent Republican candidate, won 50.7% of the vote in the second of two rounds against Mr Mitterrand's 49.3%. Speaking in English for the benefit of the foreign press, he made a statement. "You want a deep political, a deep economic and a deep social change. You will not be disappointed," he said. Mr Mitterrand graciously conceded victory but said the close result and large turnout showed a huge groundswell of support for the coalition of the Left that would surely come to power in the next presidential election. Thanks to good weather and forecasts of a close result, there was indeed a record turnout - the biggest since 1965 when France began electing its presidents by direct universal suffrage. More than 87% of voters went to the polls, 750,000 more than in the first round two weeks ago. At 48, Mr Giscard is France's 20th president and the youngest this century. As finance minister he ran the economy for nine out the past 12 years - from1962 to 1966 under Charles De Gaulle and then again from 1969 under Georges Pompidou. An ardent pro-European, he will be welcomed by the EEC whose members hope he will steer France away from doctrinaire foreign policy and an anti-American stance and push forward European integration. He is seen in Brussels as pragmatic and highly intelligent but the French working class, aware of his privileged background, regard him as somewhat cool and aloof. During the seven-week election campaign, he fought hard to change his snobbish image by kicking a football around with villagers and playing folk-songs on an accordion. But the image of him on posters all over the country alongside his attractive 20-year-old daughter Valerie-Anne probably captured the family vote in a country that is deeply Catholic, if not in church then in culture. Valery Giscard d'Estaing developed a close relationship with Germany's Chancellor Helmut Schmidt and together they turned their dream of a more integrated Europe into reality. His main contribution was the formation of the European Council in 1974, a group of all heads of state of member countries that pushed forward a European Monetary System in 1979. At home, he made several reforms in the early part of his reign - the voting age was lowered from 21 to 18, divorce and abortion laws relaxed, in spite of fierce opposition from the Catholic Church. He also saw through laws on equal pay and opportunities for women, reduced the retirement age to 60 and allowed Paris to vote in its own mayor. But as his seven-year term drew to a close in 1981 he was blamed for France's economic downturn and lost the presidential election to Francois Mitterrand.